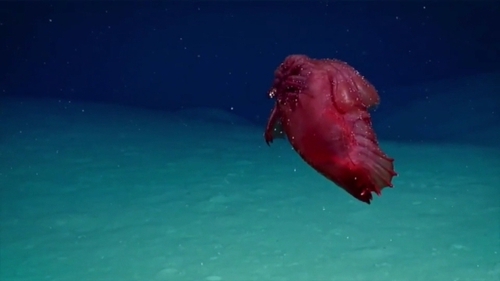 A deep-sea swimming sea cucumber, Enypniastes eximia, has been filmed for the first time off East Antarctica. The unusual creature is also known as a "headless chicken monster". It was discovered using an underwater camera system developed for commercial long-line fishing by the Australian Antarctic Division. Programme Leader Dr Dirk Welsford said the cameras are capturing important data which is being fed into the international body managing the Southern Ocean, the Commission for the Conservation of Antarctic Marine Living Resources. Before now, the headless chicken monster had only ever been filmed before in the Gulf of Mexico.